Climate Change and Human Health Programme, Columbia U. Of course, they are encouraged and abetted by the IPCC. • Warmer temperatures lead to a decrease in temperature-related mortality, including deaths associated with cardiovascular disease, respiratory disease, and strokes. The evidence of this benefit comes from research conducted in every major country of the world. • In the United States the average person who died because of cold temperature exposure lost in excess of 10 years of potential life, whereas the average person who died because of hot temperature exposure likely lost no more than a few days or weeks of life. • In the U.S., some 4,600 deaths are delayed each year as people move from cold northeastern states to warm southwestern states. Between 3 and 7% of the gains in longevity experienced over the past three decades was due simply to people moving to warmer states. • Cold-related deaths are far more numerous than heat-related deaths in the United States, Europe, and almost all countries outside the tropics. 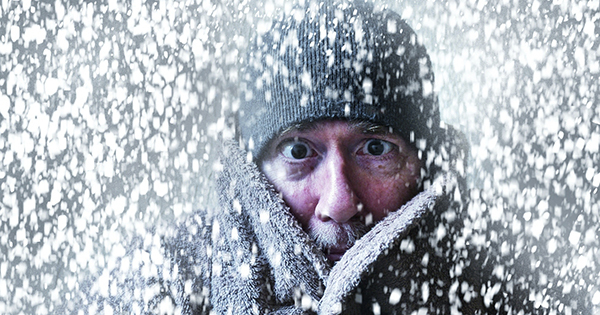 Coronary and cerebral thrombosis account for about half of all cold-related mortality. • Global warming is reducing the incidence of cardiovascular diseases related to low temperatures and wintry weather by a much greater degree than it increases the incidence of cardiovascular diseases associated with high temperatures and summer heat waves. • A large body of scientific examination and research contradict the claim that malaria will expand across the globe and intensify as a result of CO2 -induced warming. • Concerns over large increases in vector-borne diseases such as dengue as a result of rising temperatures are unfounded and unsupported by the scientific literature, as climatic indices are poor predictors for dengue disease. • While temperature and climate largely determine the geographical distribution of ticks, they are not among the significant factors determining the incidence of tick-borne diseases. • The ongoing rise in the air’s CO2 content is not only raising the productivity of Earth’s common food plants but also significantly increasing the quantity and potency of the many healthpromoting substances found in their tissues, which are the ultimate sources of sustenance for essentially all animals and humans. • Atmospheric CO2 enrichment positively impacts the production of numerous health-promoting substances found in medicinal or “health food” plants, and this phenomenon may have contributed to the increase in human life span that has occurred over the past century or so. 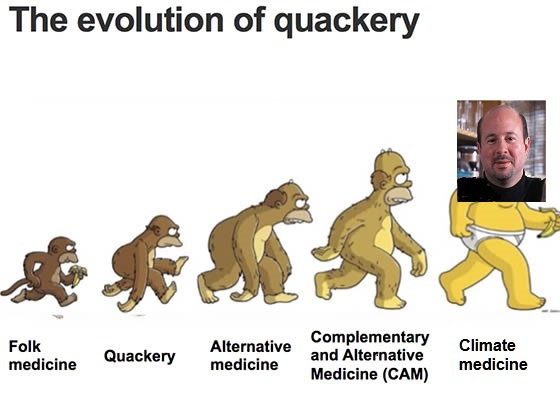 • There is little reason to expect any significant CO2 -induced increases in human-health-harming substances produced by plants as atmospheric CO2 levels continue to rise. Source: Chapter 7. “Human Health,” Climate Change Reconsidered II: Biological Impacts (Chicago, IL: The Heartland Institute, 2014). Advances in medical science and public health have benefited billions of people with longer and higher quality lives. Yet this crucial social asset has joined the list of those fields corrupted by the dash for climate cash. Increasingly, medical talent and resources are diverted into inventing bogeymen and studying imaginary public health crises. After reviewing all the research and crunching the numbers, they concluded that achieving one degree of global warming by 2050 will, on balance, save more than 800,000 lives annually. Not only is the warming not happening, we would be more healthy if it did. Oh, Dr. Frankenmann, what have you wrought? Cold weather kills 20 times as many people as hot weather, according to an international study analyzing over 74 million deaths in 384 locations across 13 countries. The findings, published in The Lancet, also reveal that deaths due to moderately hot or cold weather substantially exceed those resulting from extreme heat waves or cold spells. 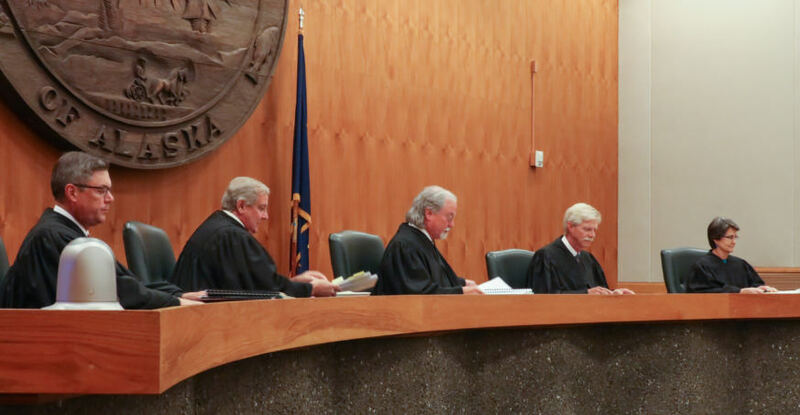 The Alaska Supreme Court hears arguments in the Boney Courthouse in Anchorage . Our Children’s Trust is at it again. The activist legal organization with deep pockets recruits idealistic teenagers to front for lawsuits so that the courts will order governments to reduce CO2 emissions. The arena is again the Supreme Court of Alaska, a soft target since it is predisposed to hear cases from disgruntled citizens. More on the latest case later on. And who are the adults involved in Our Children’s Trust? Center for International Environmental Law.. In 2014 the Alaska Supremes expressed respect for the youth while holding firmly to the law. Their reasoning is sound and adds to precedent against these attempts to legislate through the courts. From Alaska Supreme Court Opinion No sp-6953, Kanuk v Alaska (2014). 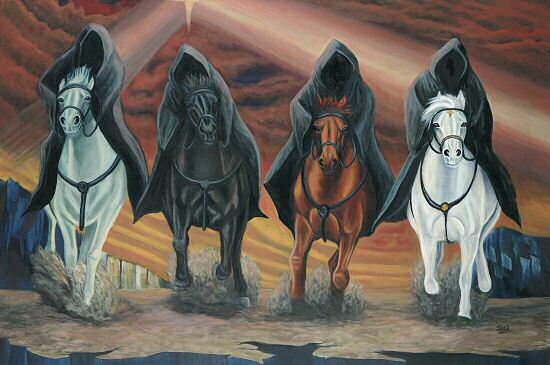 Excerpts below with my bolds. First Issue: Do Plaintiffs have Legal Standing? We recognize two types of standing: interest-injury standing and citizen taxpayer standing. The plaintiffs here claim interest-injury standing, which means they must show a “sufficient personal stake in the outcome of the controversy to ensure the requisite adversity. Accepting these allegations as true and drawing all reasonable inferences in the plaintiffs’ favor, as courts are required to do on a motion to dismiss, we conclude that the complaint shows direct injury to a range of recognizable interests. Especially in light of our broad interpretation of standing and our policy of promoting citizen access to the courts, the plaintiffs’ allegations are sufficient to establish standing. Second Issue: Are the Claims “Justiciable”? (2) whether there are other reasons — such as ripeness, mootness, or standing — that persuade us that, though the case is one we are institutionally capable of deciding, prudence counsels that we not do so. While the science of anthropogenic climate change is compelling, government reaction to the problem implicates realms of public policy besides the objectively scientific. 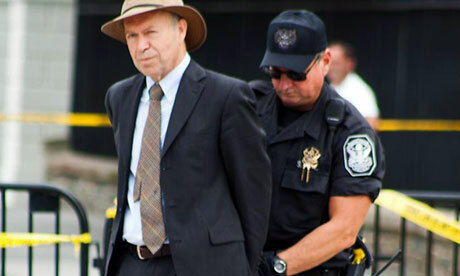 The legislature — or an executive agency entrusted with rule-making authority in this area — may decide that employment, resource development, power generation, health, culture, or other economic and social interests militate against implementing what the plaintiffs term the “best available science” in order to combat climate change. We cannot say that an executive or legislative body that weighs the benefits and detriments to the public and then opts for an approach that differs from the plaintiffs’ proposed “best available science” would be wrong as a matter of law, nor can we hasten the regulatory process by imposing our own judicially created scientific standards. The underlying policy choices are not ours to make in the first instance. This court, too, “lack[s] the scientific, economic, and technological resources an agency can utilize”; we too “are confined by [the] record” and “may not commission scientific studies or convene groups of experts for advice, or issue rules under notice-and-comment procedures.” The limited institutional role of the judiciary supports a conclusion that the science- and policy-based inquiry here is better reserved for executive branch agencies or the legislature, just as in AEP the inquiry was better reserved for the EPA. Third Issue: Is a Declaratory Judgment Appropriate? The remaining issue for us to address, therefore, is whether the plaintiffs’ claims for declaratory judgment — absent the prospect of any concrete relief — still present an “actual controversy” that is appropriate for our determination. We conclude they do not. Applying these criteria here militates against granting the declaratory relief that the plaintiffs request. First, their request for a judgment that the State “has failed to uphold its fiduciary obligations” with regard to the atmosphere cannot be granted once the court has declined, on political question grounds, to determine precisely what those obligations entail. As for the remaining claims — that the atmosphere is an asset of the public trust, with the State as trustee and the public as beneficiaries— the plaintiffs do make a good case. The Alaska Legislature has already intimated that the State acts as trustee with regard to the air just as it does with regard to other natural resources. We note, however, that our past application of public trust principles has been as a restraint on the State’s ability to restrict public access to public resources, not as a theory for compelling regulation of those resources, as the plaintiffs seek to use it here. Although declaring the atmosphere to be subject to the public trust doctrine could serve to clarify the legal relations at issue, it would certainly not “settle” them. 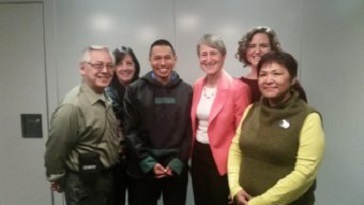 It would have no immediate impact on greenhouse gas emissions in Alaska, it would not compel the State to take any particular action, nor would it protect the plaintiffs from the injuries they allege in their complaint. Declaratory relief would not tell the State what it needs to do in order to satisfy its trust duties and thus avoid future litigation; conversely it would not provide the plaintiffs any certain basis on which to determine in the future whether the State has breached its duties as trustee. In short, the declaratory judgment sought by the plaintiffs would not significantly advance the goals of “terminat[ing] and afford[ing] relief from the uncertainty, insecurity, and controversy giving rise to the proceeding” and would thus fail to serve the principal prudential goals of declaratory relief. The Alaska Supreme Justices seem to be on their game, using their heads rather than succumbing to green threats, fears and prophecies. But the whole charade is disgusting. This is as obscene as brainwashing young Muslims to be suicide bombers. Or terrorists hiding among families to deter the drone strikes. The fact that the kids are willing is no excuse. Think of the children! How will they feel a decade from now when they realize they have been duped and exploited by activists who figured judges would be more sympathetic to young believers? Extents expanded rapidly during the last 12 days of October through yesterday, especially on the Eurasian side. At the top center Laptev Sea fills in completely, and to the left East Siberian Sea is also growing solid ice toward East Asia. Kara sea on the right is growing fast ice from the shore outward, while Barents Sea fills in from the central Arctic. The graph compares extents over the 28 days of October. 2017 has surpassed 8.1M km2, close to the 10 year average, and 700k km2 more than 2012. 2007 lags 925k km2 lower than 2017, while 2016 is 1M km2 behind. At this point MASIE and SII are showing similar ice gains in October, tracking the 10-year average. The Table below shows where ice is located on day 301 in regions of the Arctic ocean. 10 year average comes from 2007 through 2016 inclusive. The deficits to average are mainly in Chukchi and Greenland Seas, while surpluses are large on Eurasian side from East Siberian, through Laptev, Kara and Barents. Baffin Bay is also ahead of average. The National Oceanic and Atmospheric Administration / National Environmental Satellite, Data, and Information Service (NOAA/NESDIS) has an extensive history of monitoring snow and ice coverage.Accurate monitoring of global snow/ice cover is a key component in the study of climate and global change as well as daily weather forecasting. The Polar and Geostationary Operational Environmental Satellite programs (POES/GOES) operated by NESDIS provide invaluable visible and infrared spectral data in support of these efforts. Clear-sky imagery from both the POES and the GOES sensors show snow/ice boundaries very well; however, the visible and infrared techniques may suffer from persistent cloud cover near the snowline, making observations difficult (Ramsay, 1995). The microwave products (DMSP and AMSR-E) are unobstructed by clouds and thus can be used as another observational platform in most regions. Synthetic Aperture Radar (SAR) imagery also provides all-weather, near daily capacities to discriminate sea and lake ice. With several other derived snow/ice products of varying accuracy, such as those from NCEP and the NWS NOHRSC, it is highly desirable for analysts to be able to interactively compare and contrast the products so that a more accurate composite map can be produced. The Satellite Analysis Branch (SAB) of NESDIS first began generating Northern Hemisphere Weekly Snow and Ice Cover analysis charts derived from the visible satellite imagery in November, 1966. The spatial and temporal resolutions of the analysis (190 km and 7 days, respectively) remained unchanged for the product’s 33-year lifespan. As a result of increasing customer needs and expectations, it was decided that an efficient, interactive workstation application should be constructed which would enable SAB to produce snow/ice analyses at a higher resolution and on a daily basis (~25 km / 1024 x 1024 grid and once per day) using a consolidated array of new as well as existing satellite and surface imagery products. The Daily Northern Hemisphere Snow and Ice Cover chart has been produced since February, 1997 by SAB meteorologists on the IMS. Another large resolution improvement began in early 2004, when improved technology allowed the SAB to begin creation of a daily ~4 km (6144×6144) grid. At this time, both the ~4 km and ~24 km products are available from NSIDC with a slight delay. Near real-time gridded data is available in ASCII format by request. In March 2008, the product was migrated from SAB to the National Ice Center (NIC) of NESDIS. The production system and methodology was preserved during the migration. Improved access to DMSP, SAR, and modeled data sources is expected as a short-term from the migration, with longer term plans of twice daily production, GRIB2 output format, a Southern Hemisphere analysis, and an expanded suite of integrated snow and ice variable on horizon. 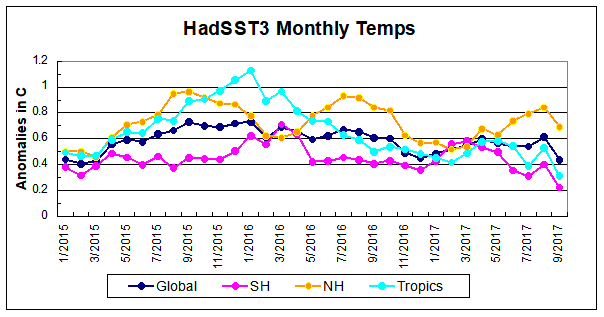 The chart below shows SST monthly anomalies as reported in HadSST3 starting in 2015 through September 2017. The August bump upward was overcome with the Global average matching the lowest level in the chart at February 2015. September NH temps almost erased a three-month climb; even so 9/2017 is well below the previous two years. Meanwhile SH and the Tropics are setting new lows for this period. With current reports from the El Nino 3.4 grid sector, it seems likely October will go even lower, with downward moves across all oceans. For HadSST3, we take an area-weighted average of all the grid boxes with data in to calculate the global average. We don’t calculate the two hemispheric series and then average them. In the case of SST, this wouldn’t work because the southern hemisphere ocean area is larger than the northern hemisphere. The uncertainty that arises from incomplete sampling is estimated and incorporated into the global average SST files. Coverage varies throughout the record with the northern hemisphere being generally better observed, but at other times, coverage is concentrated other places, dictated by where shipping happened to be at those times. Since the mid 2000s drifting buoys have provided a more uniform sampling of the world’s oceans. When we compare to other data sets, we typically compare where both data sets have data which minimizes the coverage problems. Fighting Global Warming is Absurd, Costly and Pointless. Absurd because of no reliable evidence that anything unusual is happening in our climate. Costly because trillions of dollars are wasted on immature, inefficient technologies that serve only to make cheap, reliable energy expensive and intermittent. Pointless because we do not control the weather anyway. 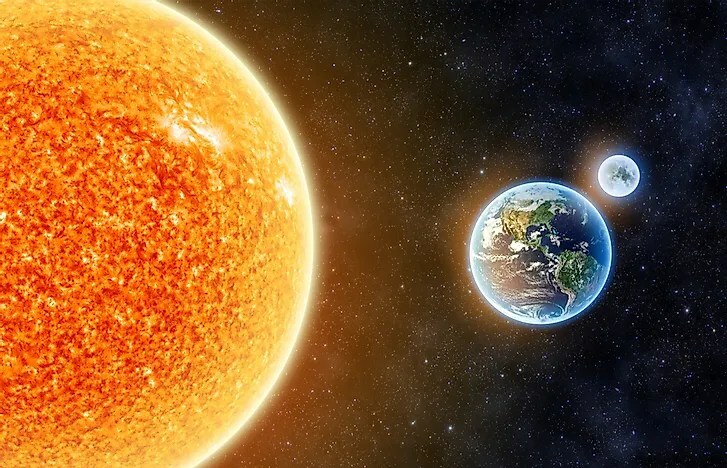 The prestigious Société de Calcul Mathématique (Society for Mathematical Calculation) issued a detailed 195-page White Paper that presents a blistering point-by-point critique of the key dogmas of global warming. The synopsis is blunt and extremely well documented. Here are extracts from the opening statements of the first three chapters of the SCM White Paper with my bolds and images. 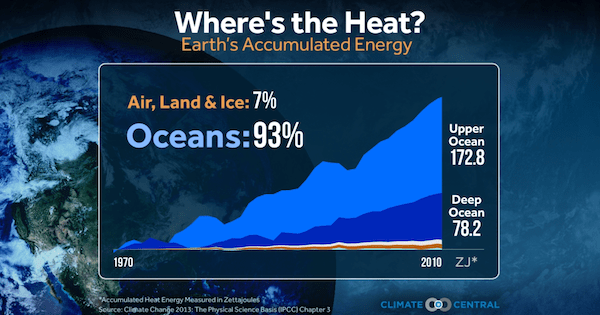 There is not a single fact, figure or observation that leads us to conclude that the world‘s climate is in any way ‘disturbed.’ It is variable, as it has always been, but rather less so now than during certain periods or geological eras. Modern methods are far from being able to accurately measure the planet‘s global temperature even today, so measurements made 50 or 100 years ago are even less reliable. Concentrations of CO2 vary, as they always have done; the figures that are being released are biased and dishonest. Rising sea levels are a normal phenomenon linked to upthrust buoyancy; they are nothing to do with so-called global warming. As for extreme weather events — they are no more frequent now than they have been in the past. We ourselves have processed the raw data on hurricanes…. 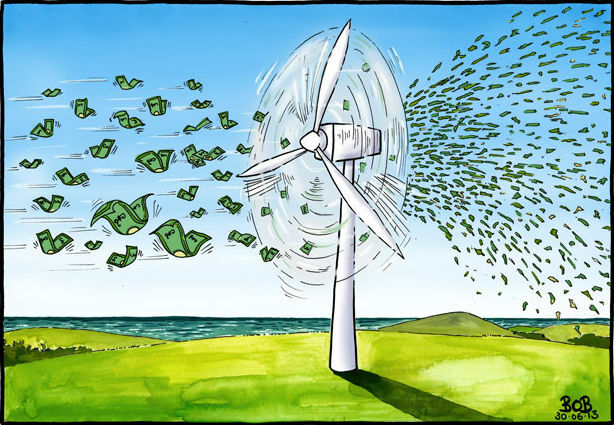 Direct aid for industries that are completely unviable (such as photovoltaics and wind turbines) but presented as ‘virtuous’ runs into billions of euros, according to recent reports published by the Cour des Comptes (French Audit Office) in 2013. But the highest cost lies in the principle of ‘energy saving,’ which is presented as especially virtuous. Since no civilization can develop when it is saving energy, ours has stopped developing: France now has more than three million people unemployed — it is the price we have to pay for our virtue…. Human beings cannot, in any event, change the climate. If we in France were to stop all industrial activity (let’s not talk about our intellectual activity, which ceased long ago), if we were to eradicate all trace of animal life, the composition of the atmosphere would not alter in any measurable, perceptible way. To explain this, let us make a comparison with the rotation of the planet: it is slowing down. To address that, we might be tempted to ask the entire population of China to run in an easterly direction. But, no matter how big China and its population are, this would have no measurable impact on the Earth‘s rotation. A Second report was published in 2016 entitled: Global Warming and Employment, which analyzes in depth the economic destruction from ill-advised climate change policies. 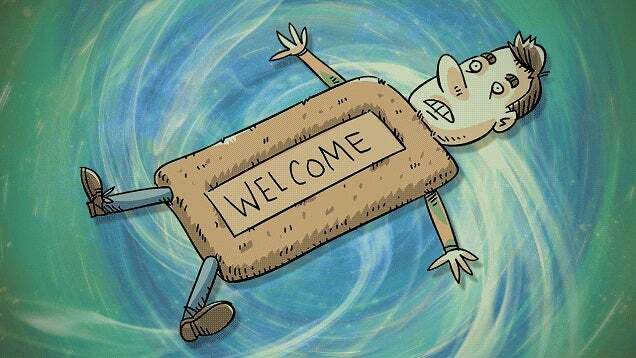 The two principal themes are that jobs are disappearing and that the destructive forces are embedded in our societies. The State is incapable of devising and implementing an industrial policy. Biofuels an especially absurd policy leading to ridiculous taxes and job losses. EU policy to reduce greenhouse gas emissions by 40% drives jobs elsewhere while being pointless: the planet has never asked for it, is completely unaware of it, and will never notice it! The War against the Car and Road Maintenance undercuts economic mobility while destroying transportation sector jobs. Solar and wind energy are weak, diffuse, and inconsistent, inadequate to power modern civilization. So-called Green jobs are entirely financed by subsidies. Go back to the basic rules of research. The real question is this: how have policymakers managed to make such absurd decisions, to blinker themselves to such a degree, when so many means of scientific investigation are available? The answer is simple: as soon as something is seen as being green, as being good for the planet, all discussion comes to an end and any scientific analysis becomes pointless or counterproductive. The policymakers will not listen to anyone or anything; they take all sorts of hasty, contradictory, damaging and absurd decisions. When will they finally be held to account? The above cartoon image of climate talks includes water rising over politicians’ feet. But actual observations made in Fiji (presiding over these talks in Bonn) show sea levels are stable (link below). The image from IMS shows snow and ice on day 296 (yesterday) 2007 to 2017, with focus on Eurasia but also showing Canada and Alaska. You can see that low Arctic ice years, like 2007, 2012 and 2016 have a smaller snow extent on both sides of the Arctic. Conversely, higher Arctic ice years like 2013, 2014 and 2015 show snow spreading into northern Europe, as well as Alaska. The pattern appears as gaining snow and ice 2008 to 10, losing 2011 and 2012, then regaining 2013 to 15, before retreating in 2016. So far 2017 is looking more like 2013 to 15. 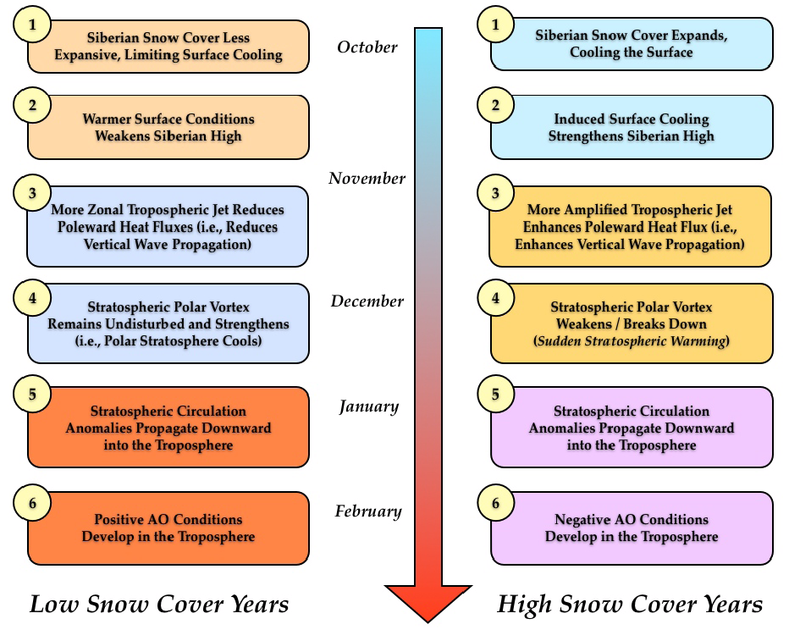 Previously I posted an explanation by Dr. Judah Cohen regarding a correlation between autumn Siberian snow cover and the following winter conditions, not only in the Arctic but extending across the Northern Hemisphere. More recently, in looking into Climate Model Upgraded: INMCM5, I noticed some of the scientists were also involved in confirming the importance of snow cover for climate forecasting. Since the poles function as the primary vents for global cooling, what happens in the Arctic in no way stays in the Arctic. This post explores data suggesting changes in snow cover drive some climate changes. The diagram represents how Dr. judah Cohen pictures the Northern Hemisphere wintertime climate system. He leads research regarding Arctic and NH weather patterns for AER. Dr. Cohen explains the mechanism in this diagram. Coupling and Their Potential Use in Seasonal to Decadal Climate Predictions by Judah Cohen. Variations in Siberian snow cover October (day 304) 2004 to 2016. Eurasian snow charts from IMS. For several decades the IMS snow cover images have been digitized to produce a numerical database for NH snow cover, including area extents for Eurasia. The NOAA climate data record of Northern Hemisphere snow cover extent, Version 1, is archived and distributed by NCDC’s satellite Climate Data Record Program. The CDR is forward processed operationally every month, along with figures and tables made available at Rutgers University Global Snow Lab. This first graph shows the snow extents of interest in Dr. Cohen’s paradigm. The Autumn snow area in Siberia is represented by the annual Eurasian averages of the months of October and November (ON). The following NH Winter is shown as the average snow area for December, January and February (DJF). Thus the year designates the December of that year plus the first two months of the next year. Notes: NH snow cover minimum was 1981, trending upward since. 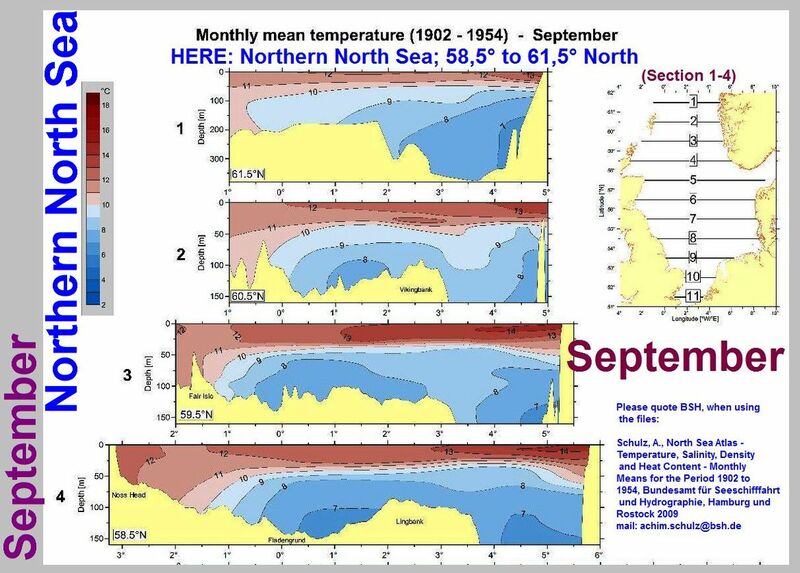 Siberian autumn snow cover was lowest in 1989, increasing since then. 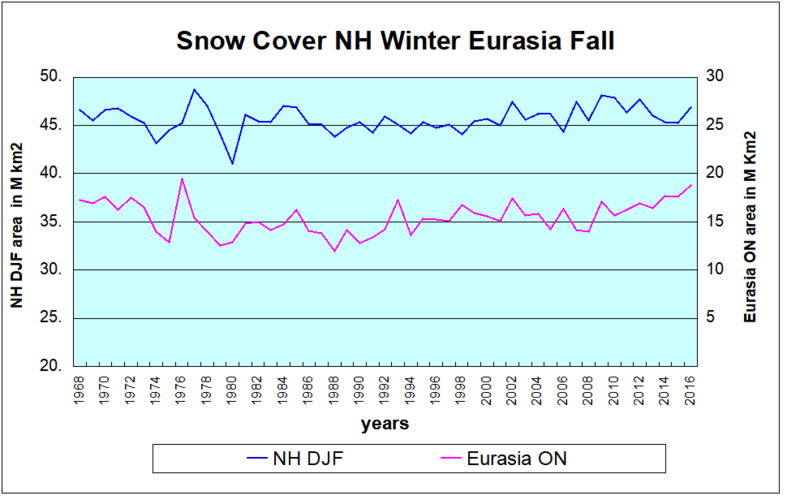 Autumn Eurasian snow cover is about 1/3 of Winter NH snow area. Note also that fluctuations are sizable and correlated. The second graph presents annual anomalies for the two series, each calculated as the deviation from the mean of its entire time series. Strikingly, the Eurasian Autumn flux is on the same scale as total NH flux, and closely aligned. 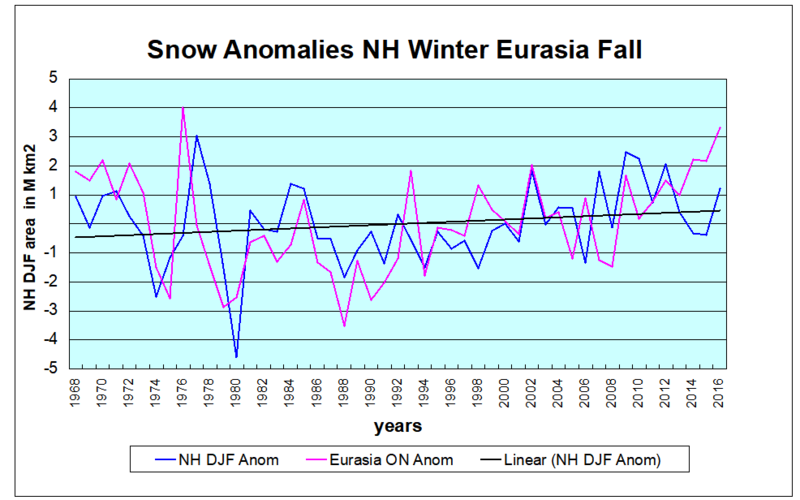 While NH snow cover declined a few years prior to 2016, Eurasian snow is trending upward strongly. If Dr. Cohen is correct, NH snowfall will follow. The linear trend is slightly positive, suggesting that fears of children never seeing snowfall have been exaggerated. The Eurasian trend line (not shown) is almost the same. The main block/high pressure feature influencing Eurasian weather is currently centered over the Barents-Kara Seas and is predicted to first weaken and then strengthen over the next two weeks. Blocking in the Barents-Kara Seas favors troughing/negative geopotential height anomalies and cool temperatures downstream over Eurasia but especially Central and East Asia. The forecast for the next two weeks across Central Asia is for continuation of overall below normal temperatures and new snowfall. Currently the largest negative anomalies in sea ice extent are in the Chukchi and Beaufort Seas but that will change over the next month or so during the critical months of November-February. In my opinion low Arctic sea ice favors a more severe winter but not necessarily hemisphere-wide and depends on the regions of the strongest anomalies. Strong negative departures in the Barents-Kara Seas favors cold temperatures in Asia while strong negative departures near Greenland and/or the Beaufort Sea favor cold temperatures in eastern North America. Siberian snow cover is advancing quickly relative to climatology and is on a pace similar to last year at this time. My, along with my colleagues and others, research has shown that extensive Siberian snow cover in the fall favors a trough across East Asia with a ridge to the west near the Urals. The atmospheric circulation pattern favors more active poleward heat flux, a weaker PV and cold temperatures across the NH. It is very early in the snow season but recent falls have been snowy across Siberia and therefore I do expect another upcoming snowy fall across Siberia. In summary the three main predictors that I follow in the fall months most closely, the presence or absence of high latitude blocking, Arctic sea ice extent and Siberian snow cover extent all point towards a more severe winter across the continents of the NH. There is a total absence of data supporting the notion of a present sea level rise; on the contrary all available facts indicate present sea level stability. On the centennial timescale, there was a +70 cm high level in the 16th and 17th centuries, a -50 cm low in the 18th century and a stability (with some oscillations) in the 19th, 20th and early 21st centuries. 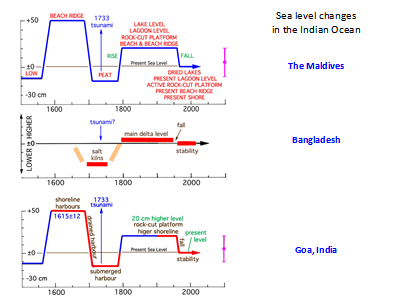 This is almost identical to the sea level change documented in the Maldives, Bangladesh and Goa (India). This seems to indicate a mutual driving force. However, the recorded sea level changes are anti-correlated with the major changes in climate during the last 600 years. Therefore, glacial eustasy cannot be the driving force. The explanation seems to be rotational eustasy with speeding-up phases during Grand Solar Minima forcing ocean water masses to the equatorial region, and slowing-down phases during Grand Solar Maxima forcing ocean waster massed from the equator towards the poles. The Intergovernmental Panel on Climate Change  has claimed that sea level is rising and that an additional acceleration is soon to be expected as a function of global warming. This proposition only works if the present warming would be a function of increased CO2 content in the atmosphere (an hypothesis termed AGW from Anthropogenic Global Warming). On a longer-term basis, it seems quite clear, however, that the dominant factor of global changes in temperature is changes in solar variability [2-3]. Regardless of what actually is driving climate change and sea level changes, the proposition of a rapidly rising sea level grew to a mantra in media and politics. This initiated a flood of papers rather based on models and statistics, however, than on actual field observations. The Fiji government will be the chair-nation at the next international climate conference; COP23 in Bonn in November 2017 . 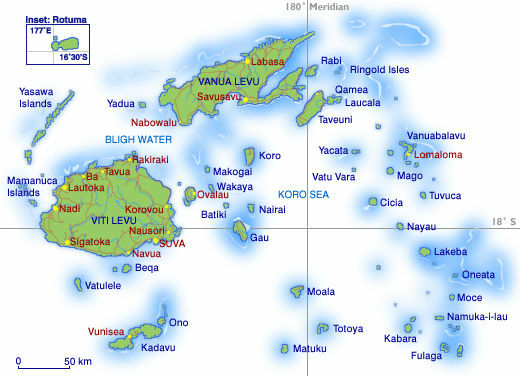 This paper represents a detailed analysis of available field observation on sea level changes in the Fiji Islands over the last 500 Years. The long-term changes during the last 500 years – i.e. a high, a low and a present level – is recorded in the Maldives , in Bangladesh [17-18] and in Goa, India, [15,18], as illustrated in Figure 3. A present long-term stability is also recorded in Qatar . 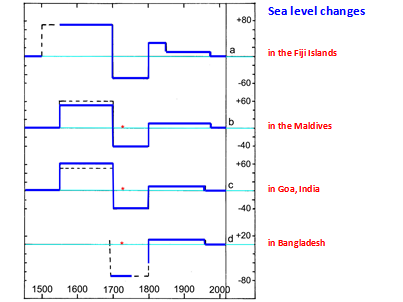 The general agreement between the observed sea level changes in Fiji during the last 500 years, and those recorded in the three Indian Ocean sites: the Maldives, Goa and Bangladesh is striking, which is a very strong (even conclusive) argument that the recorded sea level change are of regional eustatic origin . All four records show a high in the 17th century (which was a period of Little Ice Age conditions), a low in the 18th century (which was a period nearly as warm as today) and a high in the early 19th century (which was the last period of Little Ice Age conditions). This means that the Figure 3 sea level changes are almost directly opposite to the general changes in global climate. Consequently, the eustatic changes recorded cannot refer to glacial eustasy, but must be understood in terms of rotational eustasy. This calls for some explanation. The idea that oceanic water masses may be dislocated horizontally by rotational–dynamical forces was launched in 1984  and more extensively presented in 1988 . Later, is was proposed that changes in the Solar Wind strongly affects the Earth’s rate of rotation  (with a deeper analysis in ) leading to a beat in the Gulf Stream with alternations between a dominant northeastward flow during rotational slowing-down periods of Grand Solar Maxima, and dominant east-south eastward flow during rotational seeding-up periods of Grand Solar Minima . The sea level changes in the Indian Ocean, were therefore proposed [26,15] to be driven by rotational eustasy; i.e. the interchanges of water masses between high-latitudes and the equatorial region as a function of the speeding-up during Grand Solar Minima with Little Ice Age conditions and slowing down during Grand Solar Maxima with generally warm climatic conditions. In the post-Little Ice Ages period from 1850 up to 1930-1940 there was a global glacial eustatic rise in the order of 11 cm . 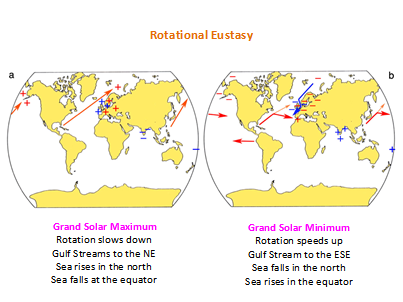 For the rest of the last 500 years, rotational eustasy seems to have been the dominant factor as documented in Figure 3 and illustrated in Figure 4. Previously, the changes in sea level during the last 500 years were not covered by adequate research in the Fiji Islands. The present paper provides a detailed analyses documenting a +70 cm high level in the 16th and 17th centuries, a -50 cm low in the 18th century and a period of virtually stability in the 19th to early 21st centuries, the last period of which may be subdivided into an early 19th century +30 cm high, a long period of stability and a 10-20 cm fall in sea level in the last 60 years forcing corals to grew into microatolls under strictly stable sea level conditions. This means there are no traces of a present rise in sea level; on the contrary: full stability. The long-term trend is almost identical to the trends documented in the Indian Ocean in the Maldives, Goa and Bangladesh. This implies a eustatic origin of the changes recorded; not of glacial eustatic origin, however, but of rotational eustatic origin. The rotational eustatic changes in sea level are driven by the alternations of speeding-up during Grand Solar Minima (the Maunder and Dalton Solar Minima) forcing water towards the equator, and slowing-down during Grand Solar Maxima (in the 18th century, around 1930-1940 and at about 1970-2000). Consequently, the values given by Garner et al. violate physical laws and common glaciological knowledge. Therefore, their values must not be set as standard in coastal planning (point 2 above). The mean sea level rise over the last 125 years is +0.81 ±0.18 mm/yr. At Stockholm in Sweden, the absolute uplift over the last 3000 years is strictly measured at +4.9 mm/yr. The mean tide-gauge change is -3.8 mm/yr, giving a eustatic component of +1.1 mm/yr for the last 150 years. In Amsterdam, the long-term subsidence is known as +0.4 mm/yr. The Amsterdam/Ijmuiden stations record a relative rise of +1.5 mm/yr, which give a eustatic component of +1.1 mm/yr. Global Loading Adjustment has been widely used in order to estimate global sea level changes. Obviously, the globe must adjust its rate of rotation and geoid relief in close agreement with the glacial eustatic rise in sea level after the last Ice Age. The possible internal glacial loading adjustment is much more complicated, and even questionable, however. Direct coastal analysis of morphology, stratigraphy, biological criteria, coastal dynamics, etc usually offers the far best means of recording the on-going sea level variations in a correct and meaningful way. It calls for hard work in the field and deep knowledge in a number of subjects. We have, very successfully, applied it in the Maldives, in Bangladesh, in Goa in southern India, and now also in the Fiji Islands. In all these sites, direct coastal analyses indicate full eustatic stability over the last 50-70 years, and long-term variations over the last 500 years that are consistent with “rotational eustasy” or “Global Solar Cycle Oscillations” (GSCO). Extents expanded rapidly during the last 13 days of October through yesterday, already gaining back to reach 50% of March maximum. On the right side Laptev Sea has filled in completely, and just above it East Siberian Sea is also growing solid ice toward East Asia. Kara sea just below Laptev is growing fast ice from the shore outward. On the left, Canadian Archipelago is now full of ice, with Beaufort spreading toward shore and next to Greenland, Baffin Bay is extending southward. The graph compares extents over the first 22 days of October. 2017 has reached 7.5 M km2, 100k km2 above the 10 year average, 800k km2 more than 2016 and more than 2012. 2007 lags 1.3M km2 lower than 2017. At this point MASIE and SII are showing similar ice gains in October, tracking the 10-year average. The Table below shows where ice is located on day 295 in regions of the Arctic ocean. 10 year average comes from 2007 through 2016 inclusive. The important deficits to average are in Chukchi and Greenland Seas, while larger surpluses appear in Laptev, Kara, Baffin Bay and Canadian Archipelago. If ice extents continue to grow at the present rate to month end, the October 2017 monthly average will exceed the 10 year October average by several 100k km2. Article below with my bolds. Climatology considers ‘natural variability’ as a valuable factor in climate change matters. Ignoring any human role in this respect is irresponsible. 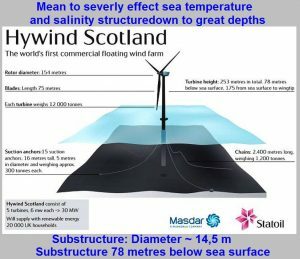 The latest big issue is floating off shore wind turbines with a structure about 78 meters submerged and 15 meters in diameters. Although a massive obstacle in a permanent moving marine environment the impact and change in ‘natural variability’ in climate change matters is completely ignored. The concern has been raised in a recent post: ”Why Europe is warming up faster than elsewhere?” The matter is simple. Off shore installations affect sea temperatures and salinity structure at many locations to about 60 meters below the sea surface. 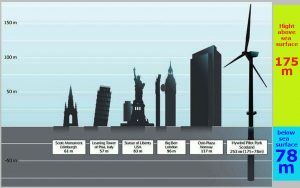 In Europe the number of off shore wind turbines will account 4000 by the end of 2017. The inevitable consequence is at hand: “Northern European winters are getting warmer and warmer at a rate higher than global average” as analyzed in a paper by A. Bernaerts (2016). 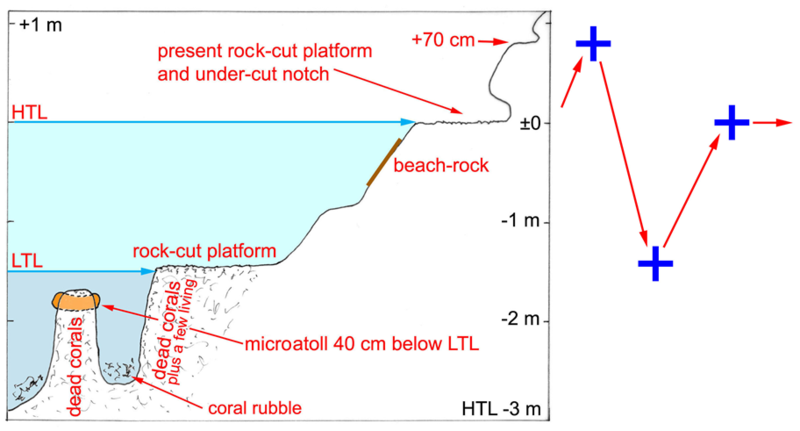 Now the impact on sea level structure increase further. The world’s first floating wind farm opened on 18 October 2017, off the east coast of Scotland. 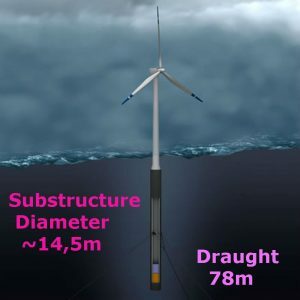 The 6MW turbines rise 175m above sea level, and extend 78m below the surface of the water, tied to the sea bed by cables. The anchors used to stabilize the turbines stand at 16m and weigh 111 tons. (Details) Inevitable huge water masses of different temperature and salinity will change between the various sea levels. As an example see Fig. 2 (Northern North Sea – Section 1-4). The sea surface will warm or cool and either warm or cool the air temperature above the scene. Any use of the oceans by mankind has an influence on thermo-haline structures within the water column from a few cm to 10m and more. Not even raising and investigating this mechanism is a demonstration that the term “natural variability” is used to hide pseudoscience. 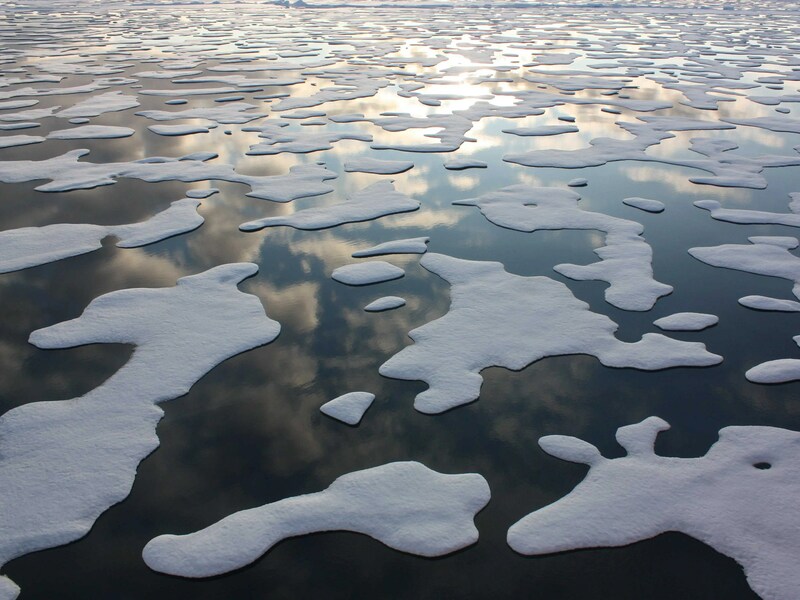 In October 2012 Arctic sea ice doubled in extent. Text below from SII webpage explains the changes in versions. NOAA@NSIDC is pleased to announce the release of Sea Ice Index Version 3 (V3). V3 changes the way the monthly average area and extent data values are calculated. The way monthly average area and extent images are created remains the same as in V2. All daily data remain the same as in V2. The V3 method simply averages daily extent values, while the V2 method derived monthly average values from the gridded monthly-average concentration field. The change is in response to questions about what seemed to be an inconsistency between daily and monthly values. When users summed daily values, and then divided by number of days in a month to get a monthly average value, that number was different, and sometimes quite different, from the monthly average numbers we presented. Both the V2 and V3 methodologies are valid and defensible ways of representing passive microwave-derived sea ice concentration data, but the goal of this change is to better match the understanding of the user community as the product evolves through time. Values will change slightly. V3 monthly average areas are slightly greater than those from V2. Conversely, V3 monthly average extents are slightly less than V2. Trends will change slightly as well. These are small changes, as the following images for March, over the entire time series, illustrate. Extent is on the left and area is on the right. Windnagel et al. (2017) offers additional analysis on why V3 areas are higher than V2 and V3 extents are lower than V2, along with a simple example. With the update to V3, there are no considerable differences in conclusions that can be made about the overall trends in sea ice area or extent. Details are in this report: Sea Ice Index Version 3 Analysis. NSIDC Special Report 19. Several posts at this blog compare results from MASIE and SII. Walt Meier, head of Sea Ice Index (SII) and colleagues did a comparison of the two datasets, published in October 2015. SII went from version 1 to v.2 in 2016, and then in January 2017 from v.2.0 to v.2.1, with some changes in past values. One of the biggest discrepancies in the past with previous SII versions arose in the Month of October, and it is timely that version 3.0 appears now. The dataset is now available with past calculations according to v3, and the past can be compared in advance of 2017 monthly results. For comparison, the graphs below show October monthly averages for MASIE compared to SII v.2 and SII v.3., 2007 through 2016. It seems clear that SIIv.3 is a big improvement relative to MASIE. And as well, October 2017 results are coming in with the two datasets tracking quite closely. 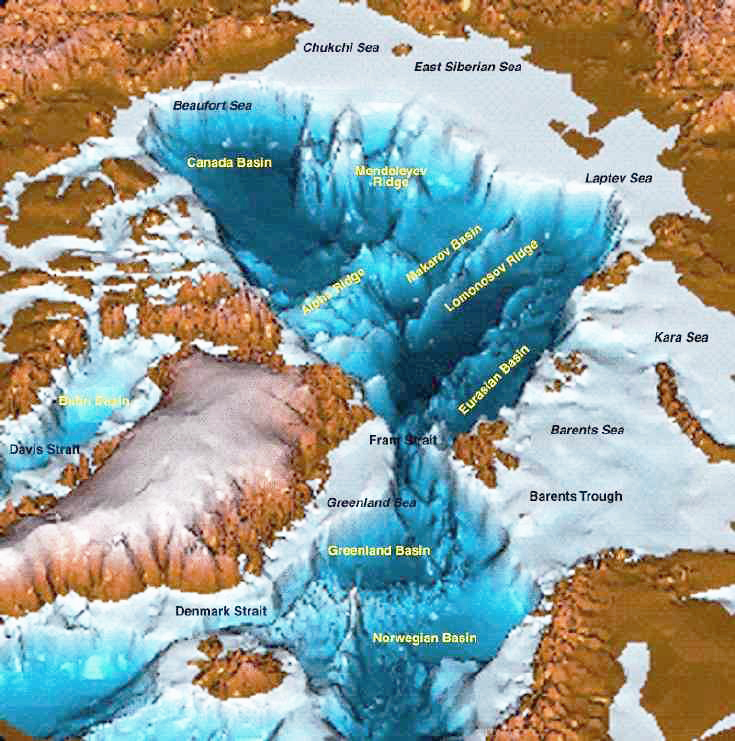 Walt Meier, NSIDC, October 2015 article in Annals of Glaciology.